Strategically located within the vibrant and dynamic entertainment precinct of Clarke Quay, Novotel Singapore Clarke Quay is one of the Lion City’s best located hotels for meetings and events. Featuring tailored accommodation and meeting packages, the hotel boasts 1200 sqm of conference space with nine meeting rooms, including a pillarless Grand Ballroom which can host up to 600 delegates. Ideal for workshops, seminars or brainstorming sessions; the meeting rooms come with natural daylight and a large foyer for guest registration, coffee breaks or working lunches. The newly renovated Phoenix Grand ballroom is the highlight of the property’s MICE facility and has a maximum capacity of 380 people in classroom-style, 500 for gala dinners or cocktail receptions for up to 600. The Grand Ballroom is perfect for conferences, company dinners & dance parties or team building events and is fully equipped with new in-built audio-visual systems and LCD projectors. The hotel also has a dedicated, experienced events team to oversee every element of any event from arrival to departure. “Refurbishing the Phoenix Grand Ballroom earlier this year was a key investment to offer the best meeting experience for our International and regional MICE guests,” said Mr Kevin Bossino, General Manager of Novotel Clarke Quay Singapore. “The Novotel Meeting concept focuses on quality service in providing hassle-free solutions and well-being for our clients. Our all-inclusive meeting packages also come with free WIFI internet to meet the needs of our meeting planners and business travellers”. 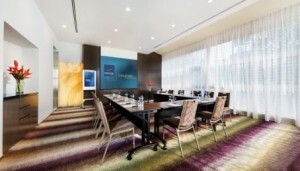 Novotel Singapore Clarke Quay’s seminar packages start from SGD50++ which includes rental of meeting rooms, coffee and tea break sessions and WIFI internet. Novotel Singapore Clarke Quay is also part of the Accor loyalty “Le Club” Meeting Planner program, which means that MICE organisers and corporate clients will be rewarded with points for any conference booking. Le Club Accorhotels points can be used for accommodation at participating Accor hotels, dining or airline miles and can be taken as part of future events or for personal travel. Offering a range of services and MICE facilities, Novotel Singapore Clarke Quay is within walking distance of Chinatown, Orchard Road and the CBD, and is also close to the Clarke Quay MRT station for easy access to all the best attractions in Singapore.